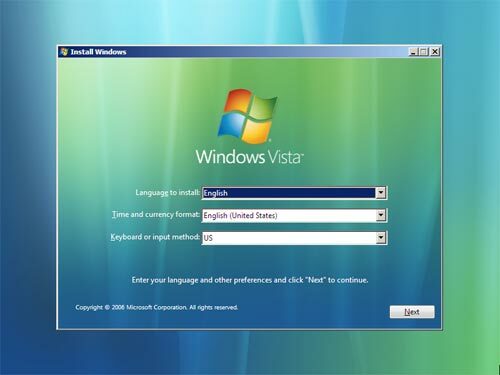 This article describes the installation of the Windows Vista operating system and includes information on creating an "unattended installation" using the answer file Autounattend.xml. The answer file must be saved on a floppy disk or flashdisk. Data contained within the file will be recognized by the installation program and used so that the user does not have to enter anything manually. To those who want to create an automated installation and modify the answer file additionally, I recommend that they download the Windows Automated Installation Kit (WAIK). Customizing options are not only intended for basic installation. We will bring a detailed article on this topic soon. NOTE! The Autounattend.xml file we published in this article is intended for a clean installation. All data on the disk will be deleted. The installation itself is very simple. If there occur no unexpected circumstances, every beginner can manage the installation without problems. I assume the user to have an empty hard disk in order to execute "clean" or "new" installation. Transferring data or installing from older Windows systems are not the main topic of this article and are recommended for more advanced users. 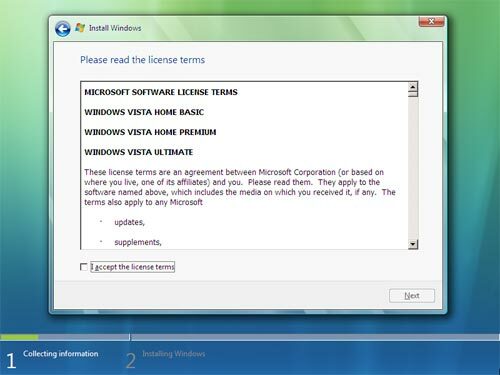 Computer meeting the minimum system requirements, ideally meeting the requirements of Windows Vista Premium Ready. Internet Connection - enables additional installation of the system updates, drives and other useful items from Internet. Antivirus program - for protection against various virus infections. In order to launch the installation in a new PC, you usually only have to insert the installation DVD. In some cases, it might be necessary to modify the BIOS settings to start from a DVD drive, or make some other modifications which requires an experienced user. There can occur some dissimilarities, depending on the used installation DVD or edition, especially in product key entry requirement (while I was writing this article, I did not have the installation DVD for end users, but only the version from the MVLS website and for testers). If there is already an operating system on the disk, there can appear a message telling you to confirm booting from DVD (Press any key to boot from CD or DVD), otherwise the Windows PE is automatically started which launches the installation itself. Microsoft Windows Pre-installation Environment (Windows PE) - a simplified tool for installation (deployment), troubleshooting and restore. Sometimes it is called simplified Windows Vista, MiniOS. In our case, the graphical interface of the installation start is important. Options for choosing language, currency and time formats, keyboard layout. Screen for starting the installation. You can also access some information you should know before you install (click the text "What to know before installing Windows") and access Repair options (features for diagnostics, repair and restore). If you are using DVD for betatesters, you will get a screen requiring you to enter the product key. For our test purposes, we can skip the product key entry and continue clicking the Next button. Before the next screen is loaded, warnings about possible consequences of not entering the product key will be displayed. 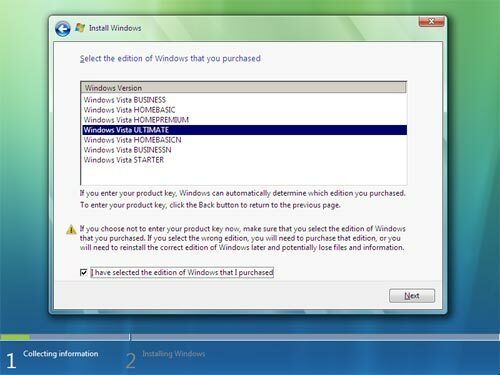 If you enter the key, the screen with version options will not be displayed and the version associated with this product key will be installed (however, the key for Vista Business did not work in this version). Automatically activate Windows when I'm online - If you untick this option, Windows will not activate automatically via Internet and you can activate Windows within the next 30 days. 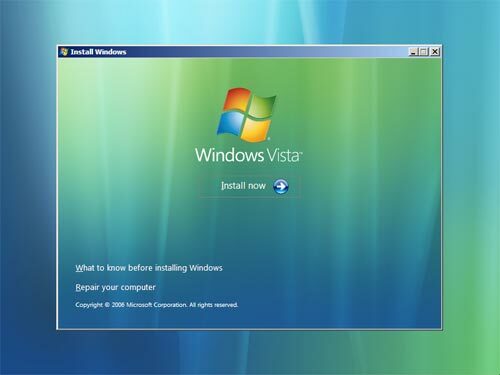 If ticked, Vista will automatically try to activate the product in 3 days. 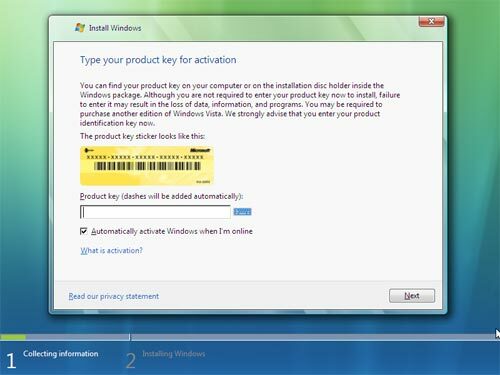 When installing the versions MVLS Business and Enterprise, the product key entry screen was not displayed. I have selected the edition of Windows that I purchased - Here you confirm that you have selected the edition of Windows you purchased and that you are aware of the incorrect selection risks. If you choose a wrong edition, you have to reinstall the system or buy the correct edition. Licence Terms - Tick to agree and continue. Installation Type - If you are running a clean installation, only the Custom option is available. Upgrade is only available upon certain conditions and you have to start it directly from the older Windows version (files, settings and applications from the previous older operating system will be retained).